BURGFALKE M-150 SCHULMEISTER. Developed from the A-15 (WN-16) aircraft, designed by the former Wiener-Neustadt company, the M-150 Schulmeister (Schoolmaster) is a two-seat, low-wing type which can be used for various duties including training, communications and liaison. 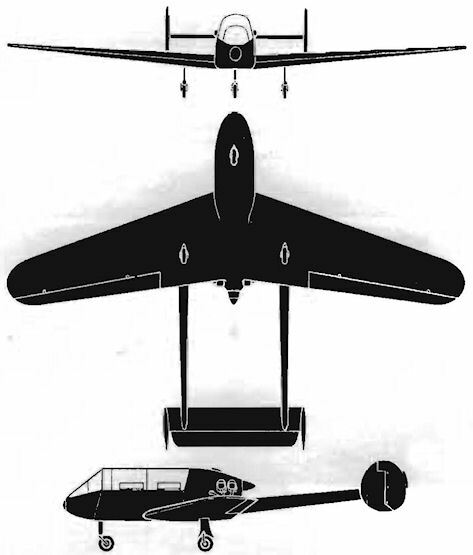 A layout incorporating a pusher propeller was chosen as the majority of German student pilots learn to fly in gliders, and it was thought that they could learn to handle a powered aircraft more quickly with an unobstructed forward view. Another point in the favour of this type of layout is that future pilots of military aircraft will most probably be flying jet-propelled types, which again have a clear forward view. The M-150 is capable of simple aerobatics, and the makers claim that it is almost impossible to spin even under extreme flight conditions. Construction is of mixed wood and steel, the main structural members being of steel. The wing and tail units are mostly of wood, with the leading edge and undersides ply covered, and the upper surfaces fabric covered. Fuselage is of a tubular structure and fabric covered. Salient features: Low-wing, twin-boom and fins monoplane with fixed undercarriage. Cockpit seats two in tandem under a large clear-view canopy.